ON LEATHER QUALITY AND PROPERTIES — Horween Leather Co.
A customer recently shared a styleforum post with me after mentioning that there has been some discussion surrounding leather quality, especially with regards to “break.” Break can be loosely defined as the physical and cosmetic character leather exhibits when the grain side of a piece of leather is creased or folded back against itself. Break is generally considered to be an important factor in footwear, as the vamp (the area over the forefoot and toes) is folded and creased against itself during each step. There are many times when break is not a consideration, such as in a belt, as the leather will never be manipulated in the same way as a piece of footwear. “Good” break presents as tight creasing, and exists across a broad spectrum. Every piece of leather will break differently given the inherent natural qualities of the hide. Break is technically the de-lamination of the grain from the layers below. The grain is a harder, more tightly organized, fiber structure than the layers even just below. These different layers have different elasticities. Further, the outer/grain and inner/flesh portions of the leather are traveling marginally different distances when flexed in a vamp. The effect is that the grain either keeps up and bends with the layers below, or it is forced outward (since it is firmer/denser and bending around a tighter radius than flesh). The grain is always eventually forced outward and the visual and structural result is break. Different formulas are developed with specific characteristics in mind – softness, tensile strength, breathability, pattern retention, water resistance, aging characteristics, etc. During the retanning process we condition the hides with oils/waxes/greases and add materials to achieve a desired combination of the characteristics just mentioned. In most cases, we at Horween use a large proportion of vegetable (bark) extracts. These bark extracts are dense, and when they bind to the hide, they fill in the gaps in the fibers. By filling these gaps with something as dense as possible, the leather becomes a durable, tight matrix. There are many different tanning agents that can be used at this stage, ranging from traditional vegetable components to modern synthetic resins. The more modern components are used at many of the larger, volume driven tanneries due to their relative ease of use, consistency, and cost. Generally speaking, the better the fill and the more dense the components, the better the break. Drying a piece of wet leather after tanning is a necessity so that the finishing of the grain/surface can take place. The hides can be dried in a number of different ways, and the effect this has on break is largely determined by the tannage. Air drying on hooks is the most traditional drying method, and yields a small hide that has good break. Good break here is due to the fact that the hide is allowed to shrink, improving density. Most tanneries dry using methods that yield a finished product that is as large as possible, as this helps spread labor and material cost over more footage, thus making a product cost less. Over stretching can lead to coarse break (overly pronounced creasing and/or pebbling) in footwear. The thicker the leather the larger the potential creases. This is not a normal concern for footwear, which rarely uses leather above 5.5 oz (2.2mm). Each part of the hide has a different fiber structure depending on where it is located. This structure is largely determined by the “work” that the hide did for the animal. Areas that did a lot of stretching or flexing have longer, less densely packed fibers; areas that did less work have short, tight groups. The latter is classically defined as the best part of the hide. As a rule of thumb, the closer to the centerline (backbone) of a hide, the tighter the fibers and the better the break. That said, areas such as the belly are not bad leather, they just require proper usage. For example, a shoe with an inside quarter panel cut from the lower part of the shoulder and a vamp from the bend would be considered one possible combination. Our goal is to make as much of the hide usable for our customer, and our customers’ goal is to appropriately use as much of the hide as possible. The shaded areas below, from left to right: side, shoulder, and bend. How a shoe is patterned will sometimes have an effect on break. This determines where and how shoe creases. 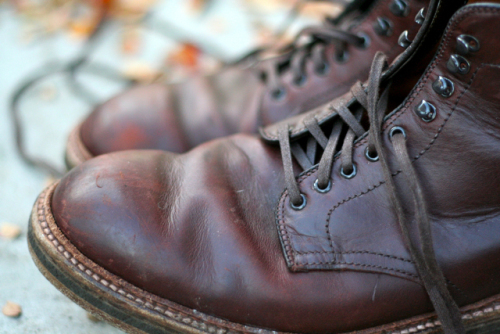 Excess leather in any area of the shoe can lead to exaggerated break. Leather is cut and then the upper is stitched together. After this is complete the bottom can be attached, whether via a welt (stitching) or direct attachment (cement). To attach the bottom the upper is pulled over a “last” to give it shape and provide a form to work on. If a shoe is pulled/stretched too tightly, coarse break can result once the shoe is worn. This is the often overlooked factor concerning break. The tannery and the shoemaker can both do their jobs perfectly, but if ones foot does not cause the shoe to flex properly, then the pattern and leather can be completely defeated. A shoe is designed to flex over the toes and this is what the shoemaker is planning for. If a shoe is too short, the vamp will break too far forward. If the shoe is too long, the vamp will break too close to the quarters and laces. Both of these scenarios can undo a shoemaker’s careful patterning, cutting, and lasting. 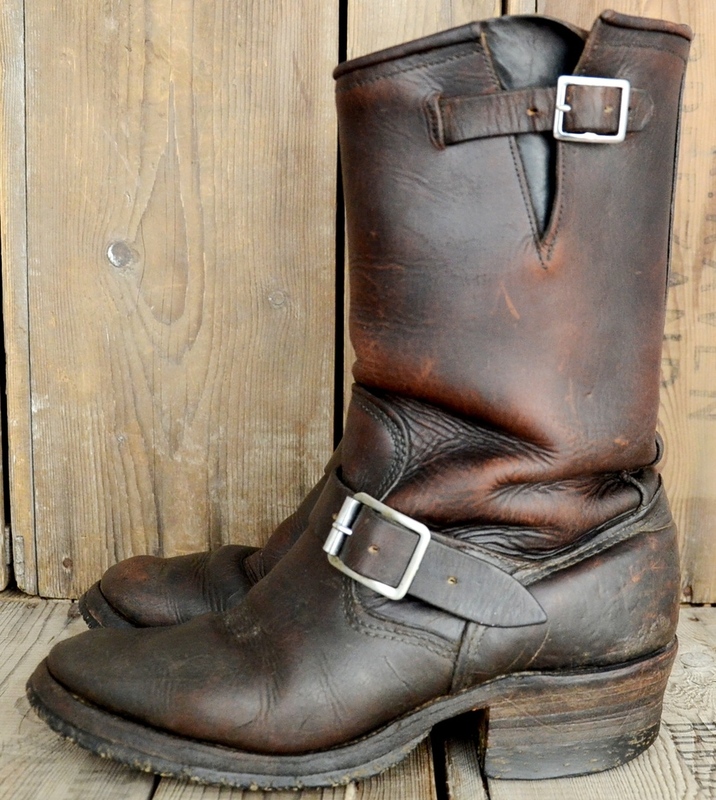 The attached gallery includes images of several different boots. Taking into account age and other factors, all of these photos show footwear that exhibit good and/or acceptable break. I’ve scavenged most of these photos – thanks to whoever took them. Please contact me through the site if you would like to be credited. I’m sure this will lead to questions, so please post your comments here and I will do my best to reply and update the above.